I've decided to fire up an ENSO thread since there is a lot of discussion growing about the upcoming El Nino threat for this upcoming Autumn/Winter. We can use this thread to talk about any ideas/thoughts for the Autumn or Winter months if you find it worthy. As we move through Summer and approach early Autumn, we could fire up an official Autumn/Winter Outlook. Anyhow, it certainly looks like we have an El Nino coming our way this Autumn and lasting through next Winter. What implications will this have? Will this be a Modoki Nino? Weak or Moderate in strength?? Will the drought in the SW and Plains get wiped out?? There is a lot to discuss as these ENSO events cause big shift in the weather pattern. Of course, not all ENSO events behave the same so we have to see how the new LRC sets up next Autumn. In any case, the latest JAMSTEC has come out and it is steadfast on a moderate in strength, El Nino, that is central based across the equatorial PAC. I made a bold prediction earlier in the year, back in March I believe, that the main storm track next autumn may shift south into the southern Plains and SW. The JAMSTEC and several other climate models are agreeing with this thought. Autumn preview??? Wet and Cool??? Autumn Global SST map....right when the LRC is setting up...folks, this is an ideal map, for many reasons, that suggests a coast-to-coast active jet stream pattern across the CONUS. We have not seen a "real" Modoki Nino event in many years. I think we have to look back to the 2009-10 season. I may end up being wrong about it only being a head-fake Niño. I wasn't sold on the Nino forming during the summer, but I'm sold on it forming this Autumn. Should be an interesting scenario next cold season if we get the southern jet to rock and roll. It'd more than likely get winter kicked off with a bang that for sure. Weak Nino and a likely -PDO(finally). Lets see what we can do. Not only for this upcoming winter, but for the 2019 severe season, because I've given up on this one. -PDO??? I don’t see any guidance suggesting a -PDO but rather a +PDO. -QBO is looking like a real possibility as well. Lots of interesting possibilities lining up for next cold season. 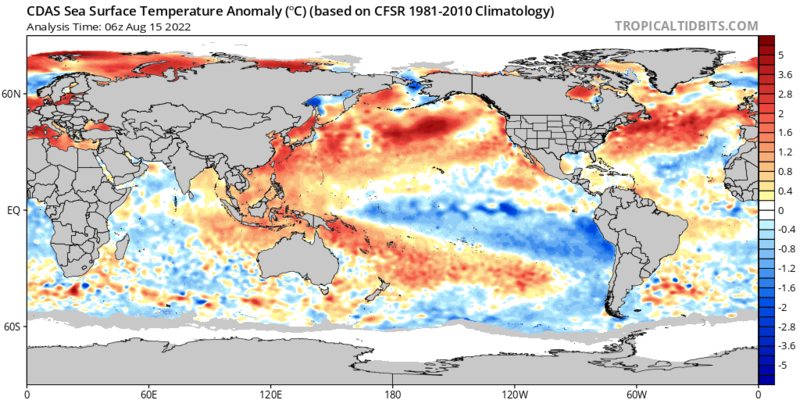 If the Pacific indeed starts following the Atlantic in the next few months, may very well see -PDO develop with a Niño. JAMSTEC/CFSv2 both showing a warm NE PAC, warm ring into the Autumn. I’m not sure we see cooling in that region, but moreso near Hawaii where convection is likely to take place in the central PAC due to a Modoki type Nino. Nino. Nice. Need a break from snowy winters, lol. Six years since my last (barely) sub-par snow total. Maybe somebody else on here can score well? OkWx2k4 hopefully. Wouldn't take much to get me excited or get me a better winter than the last 3. Not for the Midwest article, but I am sure it might have something to do w our Winter as well. I like this dude! Keep up the updates. Enjoying your videos Frankie. We really need to see this warm ridging tendency shift Northwest sooner rather than later to get PDO to spike. I could be wrong. It's going to happen next month. I'm convinced we will see the west coast ridge blossom later in July and roll into Aug. This pattern is evolving quite well and shaping up to be a pretty good summer around here. A bit of everything. I don't mind the heat early on in the summer and I'll be looking forward to a cool August. God I hope you're right and this cool pattern bleeds into September. Lincoln hasn't had a cool September since 2014 and every time we have a hot September it makes me go mentally insane. I'm hoping for a cool August as well. Definitely, even though it has been warmer than average here, has been some weather for everyone. Even on very hot days, except for one day, we have had afternoon thunderstorms or showers to squash the heat down so in my mind it's not been bad so far. I about did last September. 6 weeks of the exact same weather is just too much. Haven't had a truly beautiful autumn here in more than a decade. I'd love to see a good one like I used to see when I was younger. 12z GEFS advertising some big cooling across the N PAC where the waters have cooled off drastically. If this happens, it will knowingly continue to warm the NE PAC and set the stage for a late month amplifying ridge across the west coast. This is beginning to look like a setup we need to see more hints of starting now. Making autumn more and more interesting looking also. If the NPAC and overall general Pacific pattern leads the central CONUS by around 2-3 months, I'm going be looking forward to the end of the next 2 months. Id love a cool September and quick start to Autumn. Seems like its been a few years. I just hope the El Nino doesnt get too strong. Typically doesnt bode too well for winter weather around here. Safe bet that Nina is fully gone. Another ENSO cycle done. Here's hoping that 1+2 stays cold so winter has a prayer if I don't get robbed by a -PNA. That'd be full-on winter for the entirety of December, basically if that happened. I created this long post on Saturday and wasn't able to finish it up until now so I'll post it in the ENSO thread. I've been analyzing, studying and researching some ideas of where we may be heading as we head towards Autumn/Winter. While we just endured our 3rd mid summer heat wave, it won't be long till we begin posting/commenting about the Autumn/Winter discussion. Early on this year, I believe it was back in March, I personally felt that based on my own research that the upcoming cold season could shape up into becoming a rather extreme one for North America, as well as, in Europe. TBH, I have not felt this confident in a very long time. In fact, I don't think I have felt this confident for a pre-season forecast in my years of tracking the weather. However, as is the case in all long range forecasting, there is a chance I may fall flat on my face, but I may also get it somewhat right. I'm basing my gut feeling on what I'm seeing from all the long range models, including SST anomalies, low solar, QBO pattern recognition and finally my own intuition. There are always many factors that can collapse a 6-month long lead forecast and I'll be the first to admit it. However, I do want to say, that there is strong argument for a lot of cold air to be around for the next cold season. Where will the storm track set up is the million dollar question?? I will not even bother on figuring that out right now as we will have to wait till the next LRC sets up in Oct/Nov. Although, I will argue that it will likely have a southern bias this season which I called for back in March as nature will have to balance out the pattern and this will be the year. Here are the reasons why I strongly feel that the U.S. will be under the gun for some extreme weather. The hype may be to much early on, but this time it may have merit. All of the above info suggest high lat blocking, additionally, we are in a low solar period, which provide me with higher confidence we will see more Arctic blocking this upcoming season. Now, the SST's that are evolving in the equatorial PAC and N PAC are eye popping. I have not seen trends as such before in my years of following the weather. Maybe some of you older folks have, but to see a "True" central-based Nino, alongside a +PDO in the N PAC, this may shape up to being one of the most interesting seasons I have seen. In terms of the current state of the Arctic, another cool/cold summer is in the works, parts of Canada are enduring a "Year without a Summer" and I firmly believe we will see the early onset of the Polar Vortex across Canada in Sept, but moreso, in Oct/Nov as the new pattern evolves. 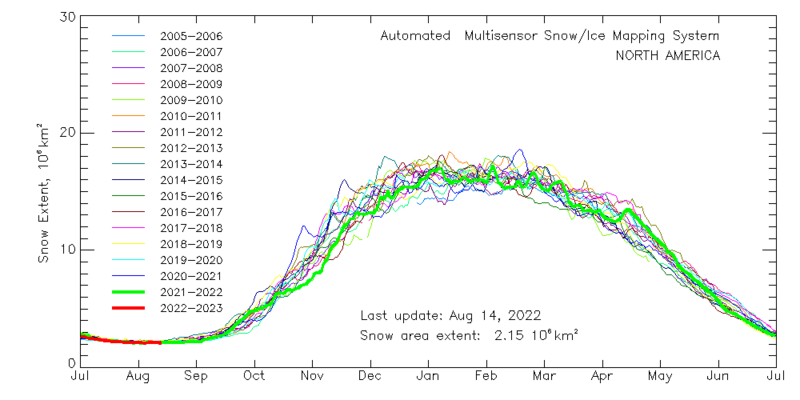 There are some models that are continuously showing the trend that Winter starts early and vigorously across Canada in the month of Sept, building up an early snow pack which has not happened in recent years. 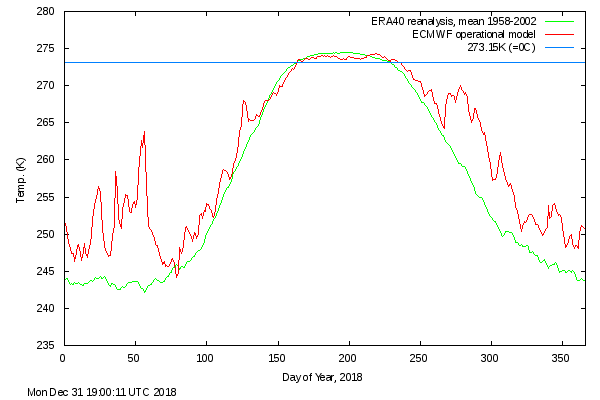 Arctic temps running below average thus far and with the summer time vortex forecasted to spin up in the next few days across the Pole, these temps will continue to stay below normal. 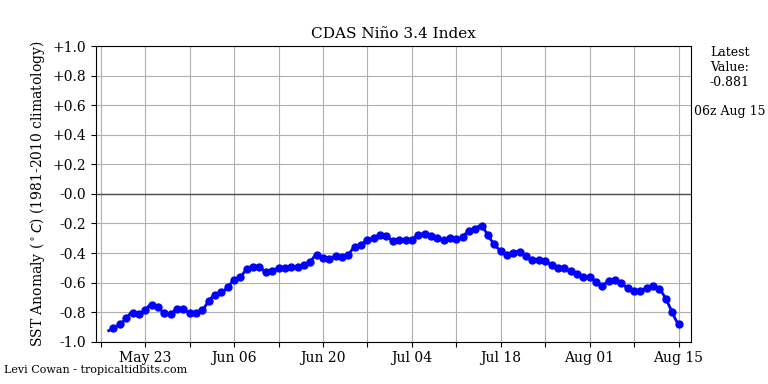 What worries me about the trends in the CFSv2 is the size/strength of the Nino across the equatorial PAC. Latest guidance is showing a peak of +1.5C (late Autumn) which would be borderline strong. Although, it does trend cooler in the all important ENSO 3.4 region as winter progresses. On top of that, it is not backing off the idea of a Modoki type Nino, all the while, the NE PAC "Ring of Warmth" continues. Of note, the ATL seaboard stays warm which may kick off early season SE ridging and keeping the main trough centered across the central CONUS early in the season. The CFSv2 has been showing a good signal for a southern stream storm track that makes sense for an El Nino season. Bodes well for the southern Plains states and Desert SW that have had a miserable past 2-3 cold seasons. Taking a look at the latest CanSIP's long range outlook, it agrees with the rest of the long range climate models that a central-based Modoki Nino is in the cards. More importantly, it evolves in the all important months of Oct/Nov. Gosh, this would be an ideal trough position during the month of October. I have not seen this type of 500mb pattern across the N PAC during the month of Oct in a long time. All in all, there are some encouraging signs that the forthcoming cold season will be an interesting one. One thing is for certain, nature is, and, will always be in control, and in the end, she will have the final say. Thanks fellas! @Jaster, maybe one day I will make a move. It’s my passion for the love of weather that keeps my drive alive. May have an idea there. 👍You are VERY good at what you do here and the way you write. You dedicate a good bit of time to make sure there's always a place or topic to start a discussion from about things to come, whether 2 weeks or 22 weeks away. May have an idea there. You are VERY good at what you do here and the way you write. You dedicate a good bit of time to make sure there's always a place or topic to start a discussion from about things to come, whether 2 weeks or 22 weeks away. Appreciate that...we have a tight group on here and its comforting to know that all our efforts keep folks curious on here and coming back to learn things about the weather. Heck, I've learned so much about severe weather from those astute members on here that are far more educated than me in that category of the weather. @Okwx, what is your gut saying about the ENSO across the equatorial PAC? You think its going to peak at +1.5C?? Essentially, more or less, a moderate Nino??? There are a lot of "ifs" associated with my thoughts at the moment but they are basically 2 camps. If we peak in October, I'm going with +0.9°C. On the other hand, if it continues intensifying or gets more support around that time from atmosphere and PDO support to continue intensifying or holding into December/January, I could see popping a 1.5°C as a very top number. Mine would be a +1.2-1.3°C max as an honest guess right now. But on a side note, you're asking a guy who said there wouldn't likely be a Niño and 2018s last gasp attempt at getting one fired up worked so here we are. I picked against my own bias initially on that one. I DO and DID WANT to see a mod-CP Niño, as those and mod-Niñas following them with HL blocking seem to be the only real shots I get at winter in the current era. (02-03, 09-10, and 2013-14. 2010-11 was a Niña, of course) three of 4 best winters here since 2000 is a bit of a trend. Until the Atlantic cooperates next decade, bring on the moderate Niños with Aleutian, Bering Sea warming! Nearing a probable 75% chance now that autumn begins early (early frosts, etc) for our agricultural friends up north. Just my thoughts now, given the very sudden development of ENSO. Also, likelihood -AO and -NAO goes up by the day. In my opinion, the longer it takes to reverse, the harder and longer in duration will be the crash. On a day like today, with a subtle Autumn-like feel in the air, I just saw JB's daily video and he flashed the latest Euro seasonal 500mb pattern for January and it is a beauty. Confidence is growing that next cold season is going to be cold and wintry one. Who gets nailed with the snow is another question, but I'm growing more confident by the day that nature is setting up a special cold season. @ Okwx, wouldn't this be something...CFS flashing snow falling in late Sep out in the Plains...what a run, likely be gone next run, but I've never seen this model flash snow in late Sept that far down south in my years of watching this model. Crazy. That's hilarious Wouldn't that be something else. We have gotten measurable September snow once in recorded history (9/29/1985, 0.8" fell), but that much snow in North Central Oklahoma in September would be absurd. Very few may believe me but back in September 2015 (I think. Could be a year off)it sleeted here at my house at around 3 am but that's the closest to winter precip I have ever seen in September. Saw snow fall on my birthday in October 2001 for around an hour. That's the earliest wintry precipitation I know of. I've never saw a model show snow in September here. Not ever. Maybe panhandle at night on like September 30th or something but never that early. Well, I was wrong, the CFS yet again paints snow across the Plains in late Sept! This model is seeing something and I'm not going to put a finger on it just yet, but if these type of runs continue into next month, then you really have to sit back and wonder how to interpret the signal going forward. CFS appears to be switching to a longer term cool pattern in the longer ranges. Ummm, ya, if the CFS continues to show maps like these by Sept 1st, I'll be all-in on an #iceage Winter for the U.S. Not gonna lie, my gut is saying the upcoming cold season will be something special for the CONUS. I have never been this confident on a season going forward. Truly, I'm seeing a lot of factors that are aligning to support that idea but we need to get through met Summer first. I'm rooting for an extreme winter my friend. A winter, you will finally get to enjoy down your way! True. Gotta get there first. From what I saw last night, models aren't even showing a hot remainder of July anymore for most of the US. Just seems like an early end to summer remains the favored outcome from a few months ago. Just nice to see model support showing up for those ideas. May finally get that beautiful autumn I was hoping for last year and never got. Your patience will be rewarded. It’s a matter of time as the universal law of averages work in your favor this year. A moderate Nino also helps to carve out a southern stream storm track. Hope your score Bigly! Yeah, that's one thing I have already established. There's no way the storm track behaves like it did to my NW the last 3 years. There are already a lot of major differences now vs the last several years. First summer in many that it has actually felt like summer for 2 months this early. I just really have a special feeling about this one (winter,fall). If law of averages holds, the next 35 years should be awesome. Seeing a -EPO and -NAO pop up occasionally this early in the year, with no sunspots, starts to stack the deck in a positive way also. The -QBO is gonna do its dirty work this year. It will be a longggg season, esp if the PV splits early. Yes. That's what the facts are starting to add up to.